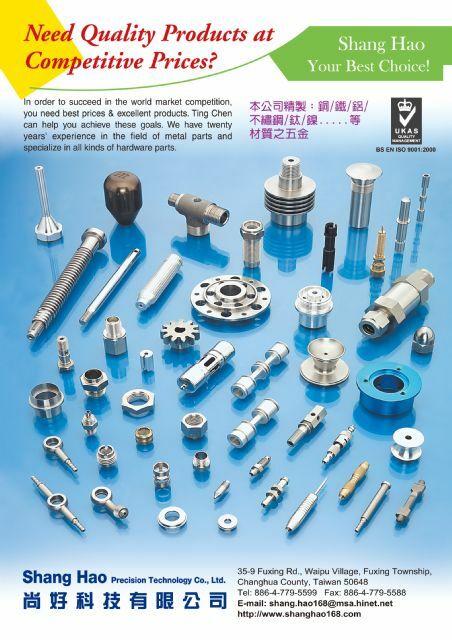 Shang Hao Precision Technology Co., Ltd.
Feb 06, 2017 | By CENS | SHANG HAO PRECISION TECHNOLOGY CO., LTD.
Shang Hao Precision Technology Co., Ltd. is a dedicated maker of metal parts for wide-ranging application, including automobiles, 3C products, industrial production, etc. To achieve qualitative consistency, the company has continued to bring in advanced production and quality inspection equipment, including CNC dual-shaft lathes, composite lathes, CNC lathes, etc., as well as a full line of QC instruments, such as 2D microprocessor microscope image measuring instrument, optical measuring height gauges, surface roughness testers, micrometers, stereo microscopes, pin gauges and hardness testers. Backed by seasoned knowledge about manufacturing and the abovementioned equipment, this maker is also capable of applying special materials, like stainless steel, Hastelloy alloy, Monel alloy, titanium, nickel, chrome-molybdenum steel, manganese nickel alloy, acrylic, SUJ2 high carbon chromium bearing steel in production, other than using brass, iron and aluminum. The extensive know-how enables the company to provide customers from different sectors with satisfactory, efficient OEM services. Shang Hao's metal parts have been widely applied in production of cars, 3C devices and other industrial products.